Following our previous time lapse showing 24 hours of flights over the United States, we’ve moved east to see what 24 hours of transatlantic flight looks like. This time lapse shows traffic over the North Atlantic from 0000 UTC to 2359 UTC on 6 May 2016. Eastbound transatlantic traffic picks up shortly before 00:00 UTC (20:00 on the US east coast) and flows steadily until about 09:30 UTC when the balance of flights shifts westward. Most transatlantic flights follow the North Atlantic Tracks: predefined flight routes that change twice daily based on factors such as the location of the jet stream. In our time lapse, the eastbound NATs begin off the eastern coast of Newfoundland and transit to the west coast of Ireland, taking advantage of the day’s strong jet stream. Westbound flights then fly either to the north or south of the eastbound traffic block, avoiding strong headwinds. An example of eastbound traffic flowing along the North Atlantic Tracks (NAT). Mapped Ocean Tracks are available to subscribers with a Gold or Business account. 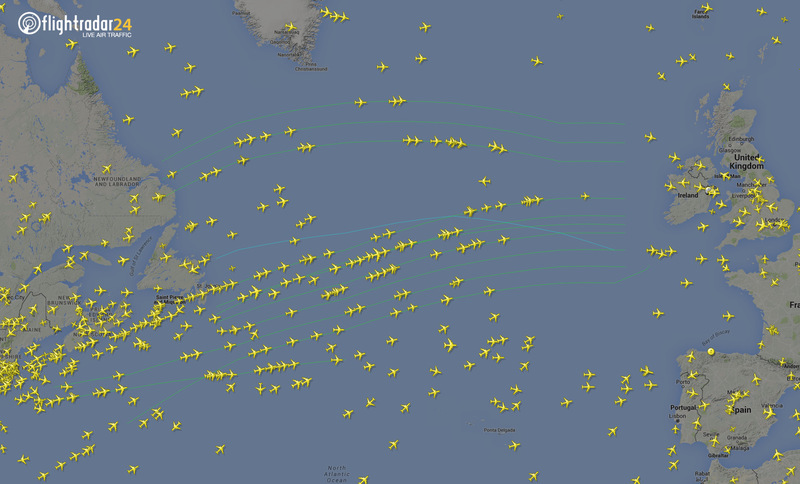 On 6 May we tracked 2,464 flights over the North Atlantic. London’s Heathrow Airport had the greatest number of transatlantic departures (136) and arrivals (127). 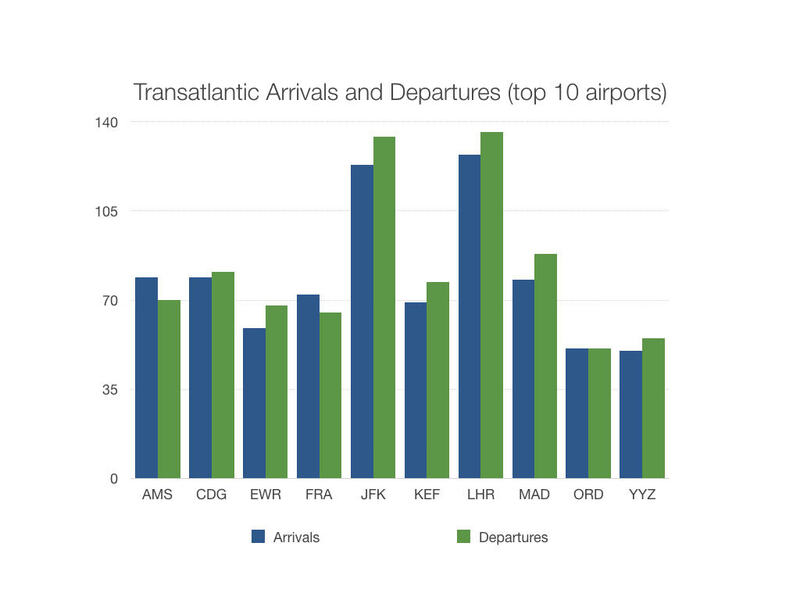 New York’s JFK Airport came in a close second with 134 departures and 123 arrivals. Given those numbers, it’s no surprise that London-Heathrow—New York-JFK is the busiest route with 41 total flights between the two airports. 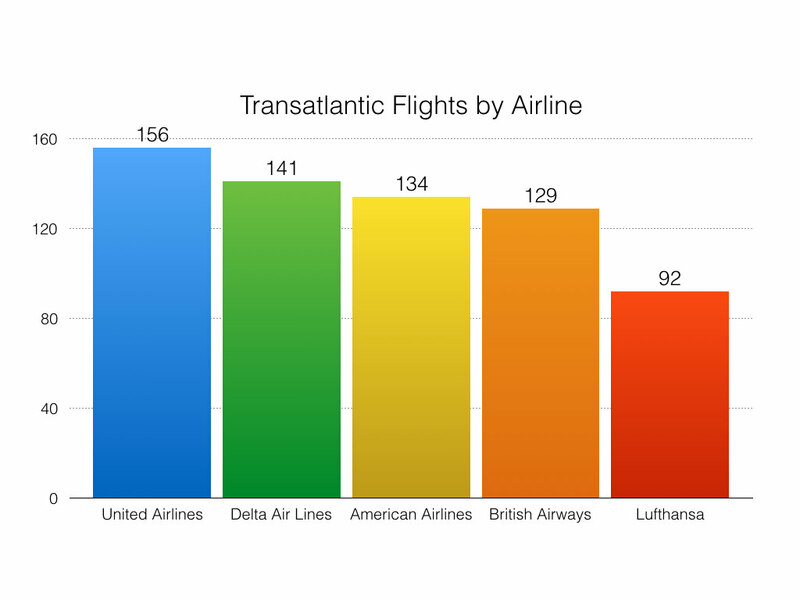 On 6 May, United Airlines operated the most flights over the Atlantic. United completed 156 transatlantic flights, 73 of which either departed or arrived at Newark (EWR), United’s east coast hub. The other two major carries in the US with significant transatlantic service came next, followed by British Airways and Lufthansa. 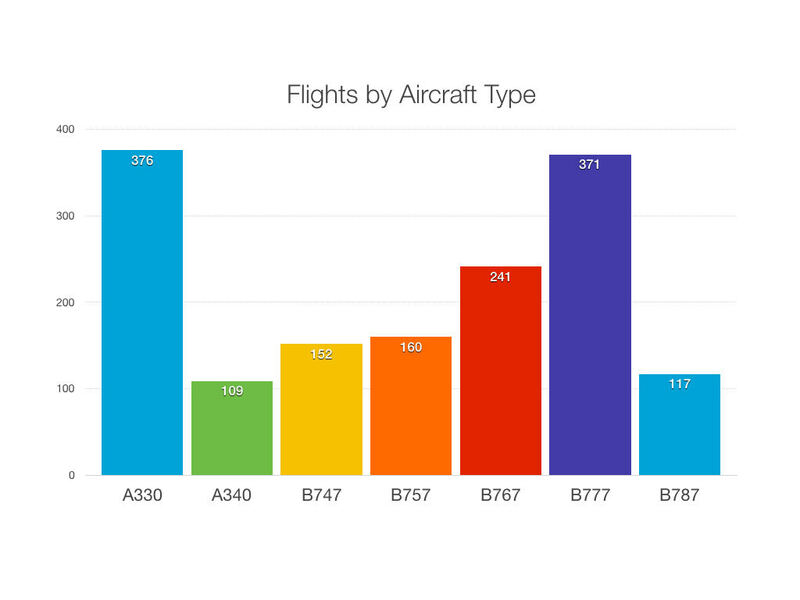 The Airbus A330 family was put into transatlantic service most often on 6 May, operating 376 flights, with the Boeing 777 family close behind with 371 flights. The A330-300 was the aircraft sub-type to operate the most flights, crossing the North Atlantic 199 times. If you watch the video closely, you’ll notice a few quirks in the paths of certain flights. Because of the way we track flights and our data sources we often lack full coverage of a flight over the ocean. For these flights, we’ll estimate coverage for up to 120 minutes after we last receive an ADS-B signal. Because flights are generally already in the cruise portion of flight at a consistent speed and track when coverage is lost, we can estimate with reasonable precision the location of the flight. If the estimation is off slightly, when the flight reenters our coverage area it can “jump” to its actual position. For many flights over the North Atlantic we receive real-time North American radar data that allow us to track a flight all the way across the ocean. This data, however, may intermittently lack certain data fields, such as heading, which can cause the aircraft icon to display as a “?”. This can also occur momentarily as flights transition from one data source to another.